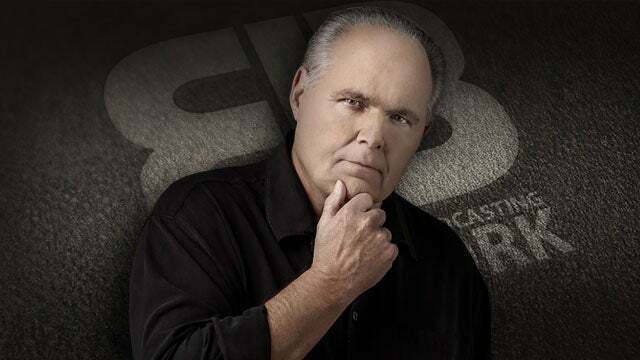 RUSH: Yeah, it's a fascinating case study as almost everything is these days with the Drive-By Media, the media left, the media-Democrat complex. The Notre Dame Cathedral fire. It is simply unacceptable. It is not tolerable. You must not even breathe the possibility of arson because if it's arson then fingers will point in one direction, and we're not gonna point in that direction. We're not gonna permit fingers to point. We're not gonna even allow thoughts in that direction. No, no, no, no, my friends. But let's play the game just to start for just a second here. Even if the Notre Dame fire was not arson, there is no denying that attacks on churches, churches throughout France, throughout Europe, are on the upswing. I'm gonna tell you something, folks. This is just me. 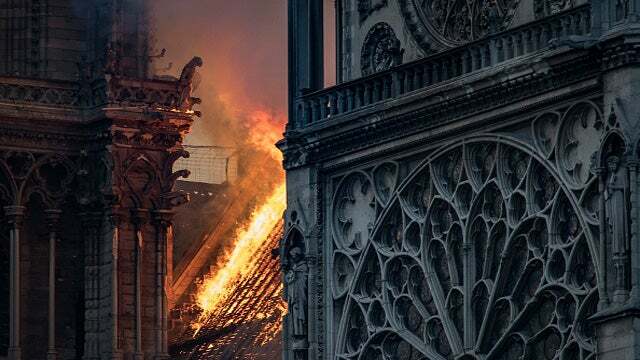 But watching those pictures yesterday as that cathedral was burning throughout the afternoon into the evening, watching all that I thought I was looking at what may well be a symbolism for all of Europe going up in flames. This is simply head-in-the-sand denial, to refuse to openly accept what is happening throughout France and throughout Europe. And the very idea that there is this concerted effort coupled with a demand to ignore all of this in my nature is all I need to believe that maybe there's some things going on that everybody knows and some just will not admit and will not permit discussion of. Because there is no denying that attacks on churches in France and all over Europe are on the upswing. It's undeniable. It's not all arson. Not random arson. And everybody knows this. So it makes all this sanctimonious concern about Notre Dame from the people on Drive-By Media cable news channels, kind of rings a little hollow to me since these same news outlets can't be bothered to even report on the attacks on churches, the attacks on Christianity that have been taking place throughout Europe and Africa, not to mention the War on Christianity in the United States, which they are helping to wage. These are undeniable things that are happening. And yet, the compulsion in the mainstream media is to do just that. Not just ignore it, but to chastise, castigate, and attack anybody who might even try to point it out, even while acknowledging the possibility that Notre Dame was felled by arson. You know, there is a trend that has developed in the Drive-By Media, and it is happening all over cable news. It doesn't matter where you go in the mainstream media. Any story that comes out, any story, if the story is a negative for the Republicans or for conservatives, then that alone is the story. However, if a story emerges that is bad for the left, like the Covington kids or the Mueller report or anything, anything that is bad for the left, anything that's bad for the media, guess what the story is? The story is not the story. The story is the right's reaction to it. And so the conservative Republican segment of our population is always the target of any story, especially stories that are bad for the left, especially stories that point to the hypocrisy of the left. Look at Trump's sanctuary city gambit. What is the news story on that? The news story is not illegal immigration and not the existence of sanctuary cities. The story is how crazy is the right? How insensitive is the right? How crazy is Trump? And so we have a version of that happening here. I can go through the Stack of Stuff today and I can show you all of the stories which are focused on all of the people who attempted to point out who might benefit from setting fire and burning down Notre Dame. The story becomes the right-wing reaction to the burning of Notre Dame, not the burning of Notre Dame. You see how this happens? And so throughout the Drive-By Media today there are stories on all of the supposed lamebrain, Looney Toon conspiracy theories out there to explain this rather than an open and honest, factual presentation of what the heck might have happened. No, no. It is already established, and you can't challenge it that this was arson started by somebody who flicked a cigarette. Even though no official investigation has even begun nor been announced, nor the conclusions released. Oh. And also part of the story is making fun of Donald Trump and his reaction to the fire. So you see, folks, whatever the story in the Drive-By Media, the story is either going to be how bad it is for the right or how crazy and conspiracy oriented the right is. This is not something that has been common for very long. It's relatively new. I mean, it's not brand-new. It didn't just start last month or last year. But it is something that if you pay attention, you will notice. So any attempt, any attempt to bore in on a possibility outside of arson is met with, "That's a conspiracy theory. You're a kook. You're dangerous. We know you want to blame Muslims, and we're not gonna let you blame Muslims. We know that Muslims couldn't be responsible. And even if they are, no, we're not going there, we're not going." So the story becomes how crazed and conspiracy oriented the right is. And what we're not getting is even a pretense of curiosity as to what really happened here. You notice the Drive-Bys will not even allow anyone to even mention the possibility of arson. As I say, even on Fox News, supposedly conservative news network, a couple of anchors had occasion to cut off their guests, Bill Donohue being one, when they began to speculate the fire could have been intentional. And they didn't say "Islam," and they didn't say "Muslim." They didn't have a chance, they didn't have a chance to get that far because their microphones were cut off. Ilhan Omar: Some people did something on 9/11. What do you mean, some people did something on 9/11? That story has become the right wing's attack on Ilhan Omar, not on what Ilhan Omar said and what it might mean. If anything has any potential to go against the narrative of the left, then the story will become how the right is a bunch of crazed, wacko, conspiracy-oriented theorists. Now, we're supposed to accept the word of the French authorities who say they know for a fact the fire was accidental, even though they have not even begun to investigate its cause. By the way, it's not the first church fire in France. This is not the first event of this kind in France. Certain neighborhoods in Paris are now off-limits to the cops. You can't even go there. Not supposed to go there. But we're not supposed to tie any of what we know even as a possibility in a list of things that might explain this. Can't even go there. I can't get past those images of Notre Dame, the roof or the spire in flames and, in a sense, seeing much of Europe in a symbolic way. It’s supposed to be crazy, it’s supposed to be even dangerous to imagine this could be anything but an accident. Dangerous. Very, very dangerous. Don't go there. Even though a report from France's own central criminal intelligence service noted that from 2016 to 2018 there have been thousands of cases of church vandalism, thousands of cases of church -- not synagogue, not mosque -- church vandalism. Thousands of cases from 2016 to 2018, two years. It peaked in 2017, 1,045 cases of church vandalism in France. And according to the French ministry of the interior, when cemeteries and other sites are taken into consideration, the number of acts of church vandalism rose to 1,063 in 2018. But we're supposed to ignore that. That's not relevant. Anybody that wants to look at that is a crazed conspiracy theorist. 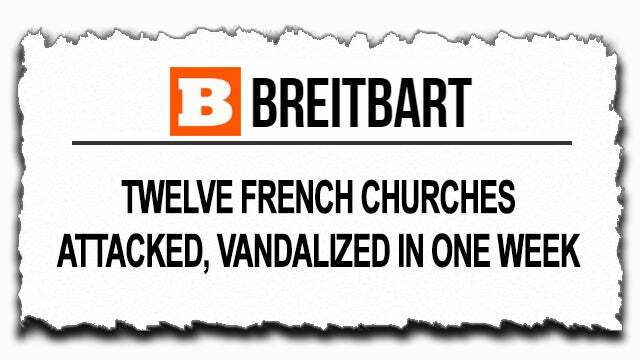 In fact, folks, earlier this year in one week alone, France saw 12 churches vandalized, including attackers attempting to set fire to the church of Saint-Sulpice. In Nimes, vandals smearing feces on the wall of the church of Notre-Dame des Enfants, stole objects from the altar. In March, the over 800-year-old Basilica of Saint-Denis in the now heavily migrant-populated suburbs of Paris, where cops can’t go, was also vandalized, with the basilica's organ being heavily damaged and stained glass windows were broken. I mean, this is happening all over the country. It's happening all over Paris. But but but but, no, no, no, no. Uh, uh, we're not gonna admit it, acknowledge it, we don't want anybody to know about any of that. Why? Who are we afraid of offending? Why are we afraid of offending? What are we afraid of discovering? Why are we afraid of discovering it? Well, I'll admit here this could all be irrelevant. 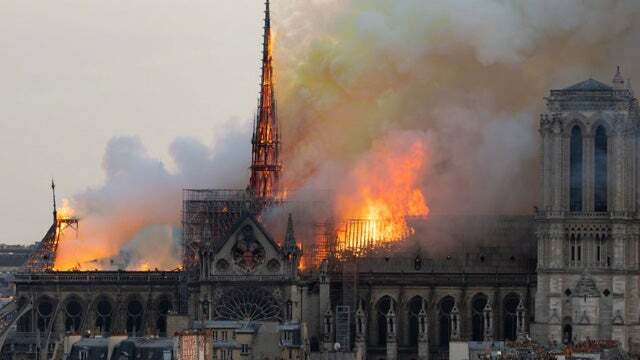 The Notre Dame fire could very well have been accidental, caused by some construction worker flicking a still-burning cigarette. But as a thought experiment, apply all the numbers that I just recited to black churches in the United States, and then imagine a fire like the one at Notre Dame at a black church in America, and then imagine how the media would react to that. The speculation on who on the right could have been responsible would be the story. There wouldn't be any, "Hey, let's not jump to conclusions. It could be arson. It could be totally innocent. Let's not go there." Every guest would have been required to blame such a fire at a black church in America on white nationalists. I was watching a TV show last night. Sometimes I watch NCIS Los Angeles. You can't turn on a television show these days without white nationalists -- and somebody define that for me -- without white nationalists being the villains. White nationalist, crazed Alt-Right, ultraright wingers. People that had nothing to do and have nothing to do with -- the Covington kids is an example. They got blamed! They were inciting the riot because they were wearing Trump hats, that made them evil. I've got a Stack today on the tax cuts and the nine outright lies that were told about Trump tax cuts that a lot of people ended up believing. And one of the lies was told by Lawrence Summers, who is the former Treasury secretary, former president of Harvard. He actually said that the Trump tax cuts would result in an additional 10,000 people dying in America. And it was reported without question. It was reported with applause. So for some reason one of the chief fact-finding organizations, institutions is doing everything but. Why? Well, the question answers itself. I'm asking it rhetorically. RUSH: And to prove the theory that if a story has any possibility of looking bad for the left, then the story is the right's reaction to it. I have here a shameless example from the Associated Press. Here's the headline: "Trump Offers Unsolicited Advice on Fighting Notre Dame Fire." So here's the president of the United States, who's tweeted some really beautiful thoughts about this and knows a lot about construction and accidents and fires and all kinds of calamities that happen in buildings. He knows how to put out fires. He knows these things. It was his business. So the president of the United States tweeted some things yesterday (paraphrased), " Maybe they could have some tankers fly over the place and water bomb it," and of course the French authorities took two hours. It took them two hours to get to this location. Are you aware of that? Did you hear that? It took firefighters two hours to get there and get set up and get going. So Trump sends out his tweet, and French say, "Well, well, that just shows your president doesn't know what he's talking about. If you firebomb with water from a tanker plane flying over, you're gonna collapse the roof." Uh, duh? The roof had collapsed! The objective was to save the structure and some of the contents from at least being burned to smithereens. But the headline here: "Trump Offers Unsolicited Advice," much like "Trump, without evidence, suggests that the Mueller report's a witch hunt." Utterly... They can't help themselves. They just can't help it. See, they're even using the fire at Notre Dame to attack Trump. "As a catastrophic inferno tore through a cultural treasure, President Donald Trump assessed the response from 4,000 miles away and offered unsolicited advice for firefighters trying to save Paris’ Notre Dame cathedral." Mind you, the AP and others have no problem publishing stories from psychiatrists who psychoanalyze Trump who've never met him and that's perfectly fine.